Aimee is letting me borrow her Verizon G-Pad 8.3" tablet since my larger Sony 10.1" may or may not be sold along with my WJ. Right now the G-Pad is just going to be for topo maps and not integrated with audio or anything else. 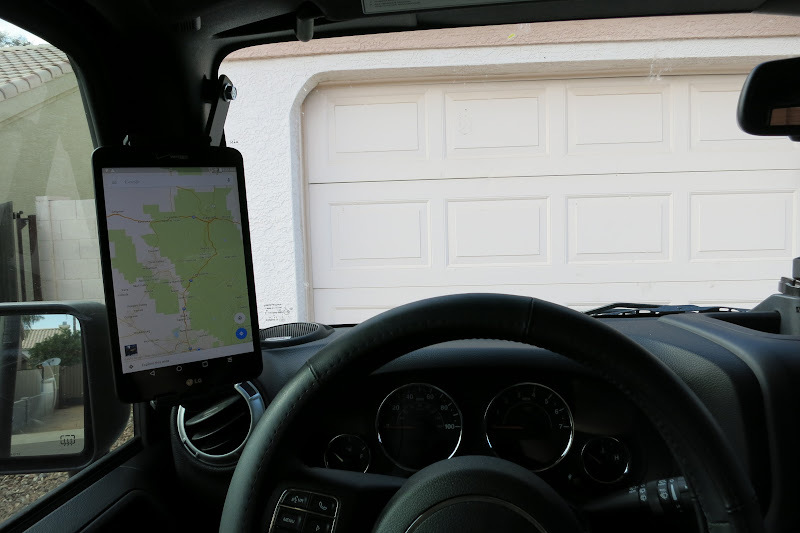 The 2016 JK factory premium sound radio (430N) has decent on-road navigation and works with my phone over bluetooth for calls and streaming audio, so I'm leaving it alone (for now)! 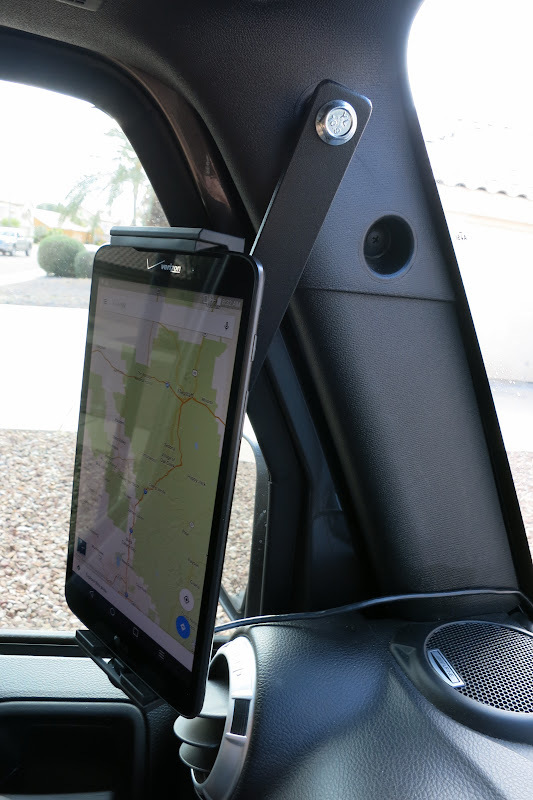 With the 8.3" tablet, you only lose about a half inch of visibility on either side of the A-pillar in this location. A 7" tablet would be perfect here and not cause any view obstruction. 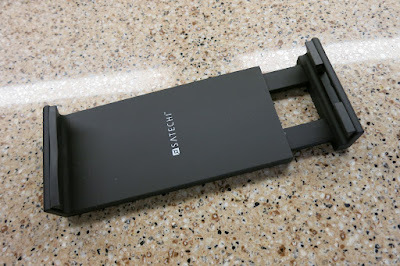 One of the RAM Mount Tab-Tite products could be used instead of this clamp, or a ProClip custom tablet cradle. 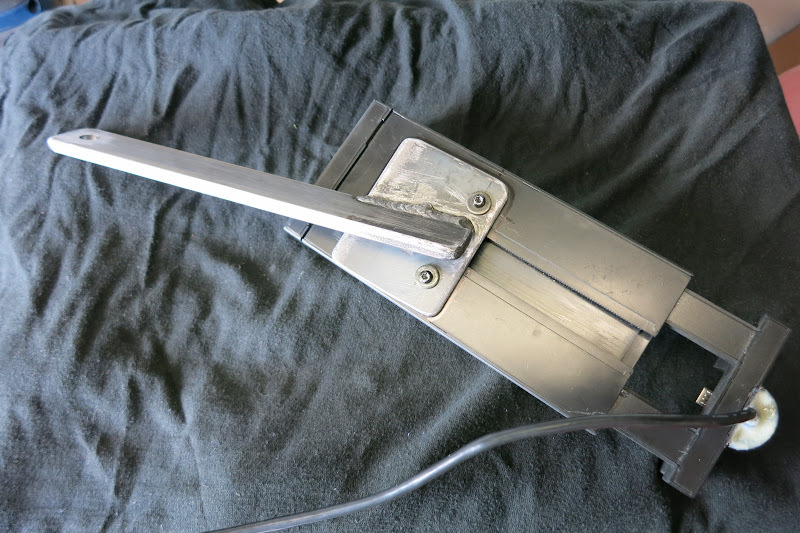 For the actual bracket, I used a 1" x 1/4" steel bar about 10" long, welded to a small steel plate. 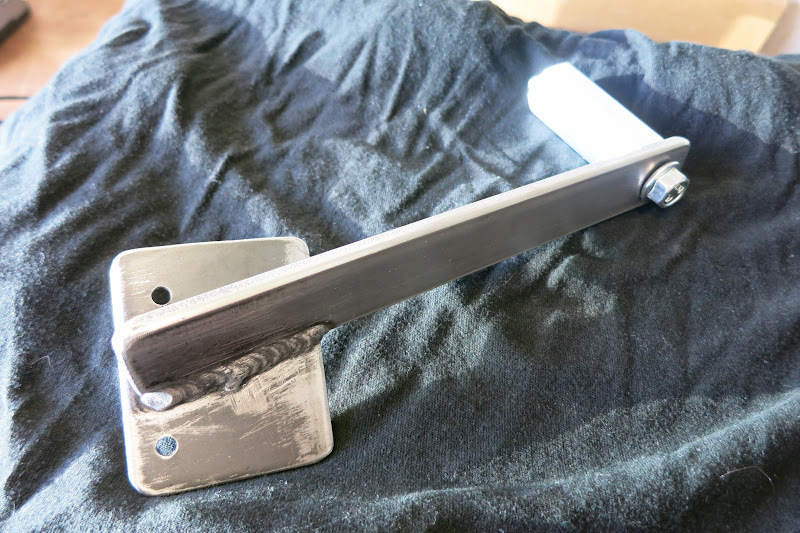 This custom bracket attaches to the Jeep with a single bolt, through a 2 1/8" long stand-off, into the factory upper A-pillar bolt-hole location. 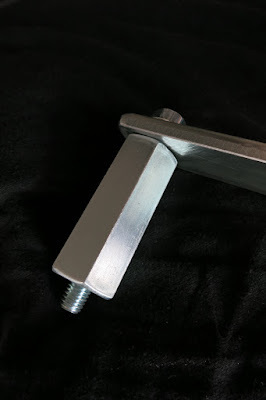 I had noticed that some of the grab handles which mount to this location call for tightening that bolt to 300 ft-lbs (EDIT: supposed to be in-lbs, doh! ), so think it's a pretty solid place to mount something. 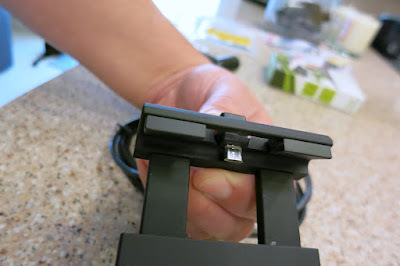 The Satechi cradle is attached to the bracket with 3M double-sided trim adhesive tape and a couple tiny screws. It turns out there's zero flex, thanks to the 1/4" steel used for the main arm and large diameter stand-off. I was actually more worried that the plastic cradle might not hold up to extended off-road use. However, I tested by doing a few hours of high-speed travel over severe washboard roads this weekend and everything seemed extremely solid. I'm currently running the power into a USB charger in the factory dash outlet, so I'll need to rig up somethign more hidden if I keep this for a while. As you can see from some of the photos, I've already done a textured black paint. 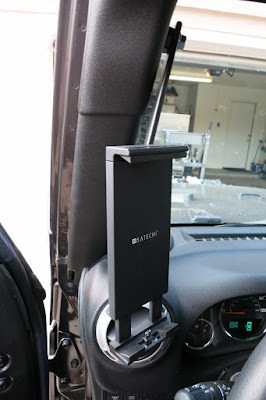 I did actually bend the arm just a bit in a vise after these photos were taken - to bring the tablet a little closer to the dash vent. So, I'm in the process of re-painting the bracket and also waiting for a nicer looking main bolt to use. Since the local Ace only had a regular shiny hex-head bolt, I ordered a M8 x 1.25 X 70mm allen button-head bolt in black oxide finish from Bolt-Depot online. I'm not sure if this would be a good location for on-road use. 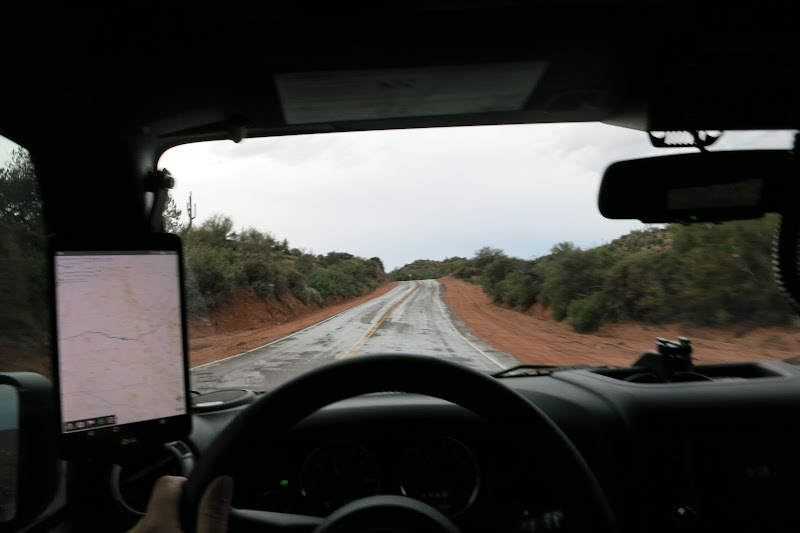 It does help keep your eyes near the road when glancing quickly at the screen. but it could also be a little distracting always in the line-of-site. For my current off-road only use, I think it will be perfect. Last edited by theksmith; 05-17-2016 at 08:19 AM. An amazing job again. Thanks Kris. Very nice. I am using the Carolina Metal Master grab bar handle to hold my iPad. I had noticed that some of the grab handles which mount to this location call for tightening that bolt to 300 ft-lbs, so think it's a pretty solid place to mount something! as usual, there you go making sense again! got my $6 black bolt (darn shipping costs)! Last edited by theksmith; 06-12-2016 at 06:34 AM. 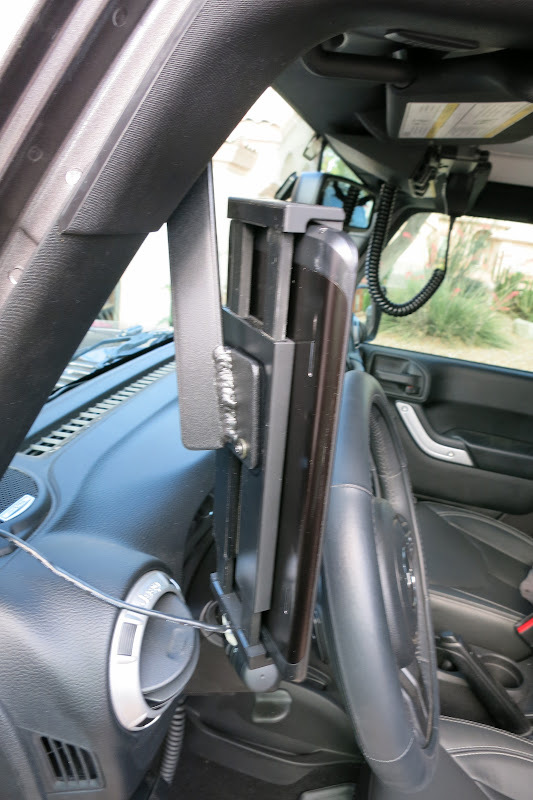 makes it even cheaper to grab that and a RAM Mount arm plus one of their tablet holders and have a very solid, easy mounting solution!